Unfortunately, default Magento 2 promotions have limited functionality. Therefore, such tools as Amasty Free Gift for Magento 2 and 1 (Auto Add Promo Items) are popular among merchants. Using this solution, you will be able to bring a diversity of promotions to visitors and give them lots of reasons to become returning buyers. As for the Magento free gift product extension, it makes customers more loyal since every purchase on your website can be associated with something positive and friendly – a free gift. At the same time, you get a perfect opportunity to clear your stocks from unpopular items. Below, we describe the Magento 2 gift extension by Amasty in more detail. 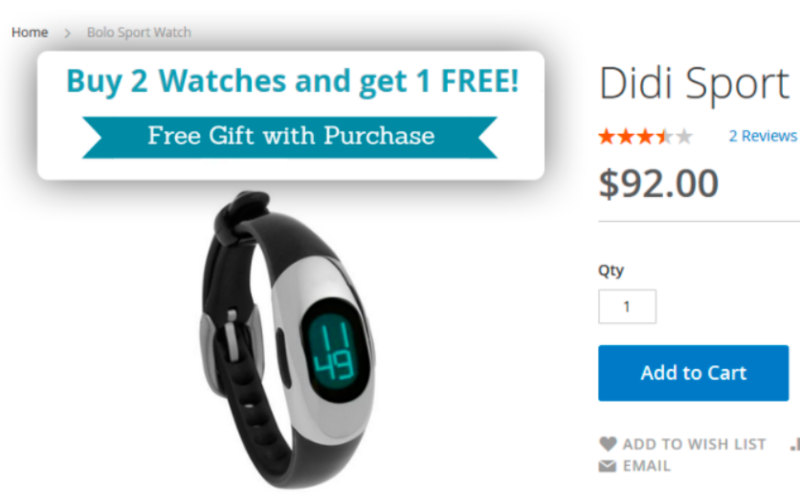 How does this Magento 2 free gift extension attract customers? First of all, it allows you to add a free gift to cart on the basis of various conditions – Magento 2 free product with purchase feature. Besides, the same product can be added to the cart when a promo item is placed there. Alternatively, the Amasty free gift Magento 2 extension allows providing gifts products for the whole order, for the specified amount of money, or dependant on the quantity of the same items in the cart. 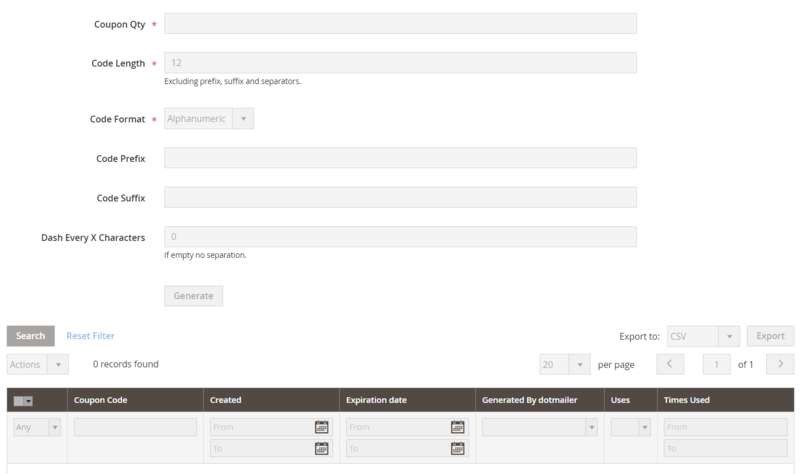 You can easily create conditions based on product and cart attributes or products subselection. Besides, this Magento add free product to cart extension allows creating condition combinations to make your campaign even more precise. Also, you can offer customers to choose a gift they like from multiple options. 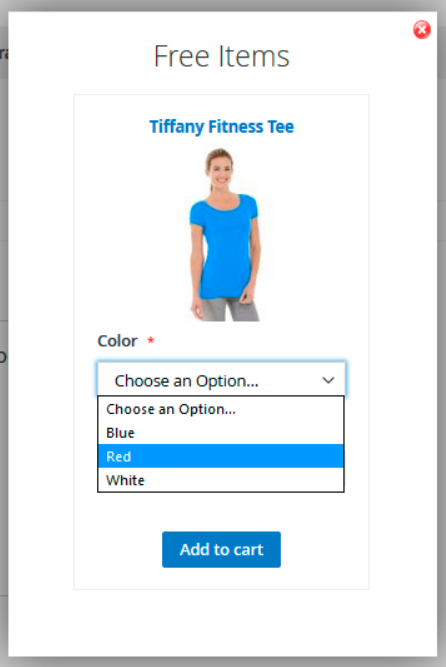 While in a cart, you can specify where to open a popup window to provide a customer with the ability to select options of a gift for configurable products. Besides, it is possible to offer discounted products from your catalog as a gift. Moreover, due to a stock functionality support, out-of-stock items will be eliminated from each free gift campaign. To make your offer more appealing to customers, add a gift message that will be displayed next to the promo product. You can also show a reminder on the checkout notifying customers of the opportunity to get a free bonus product. As for coupons, Amasty’s Magento 2 gift extension allows adding promo items to cart after a coupon code was applied. Furthermore, the Magento 2 gift product module allows using the eye-catching design for promo banners and placing them on top of the product pages or above the Add to Cart button. In this way, you can easily attract website visitors’ attention to your promo offers. Besides, you can display images of gift products and add special labels to promo items on a product page. Have you ever imagined such a handy tool? Luckily, all the drawbacks of the default Magento 2 platform can be covered with the help of third-party modules, and Amasty Free Gift is among them. Further, we shed light on how to use the extension from the perspective of a backend administrator. Note that all columns have filters and support sorting (the exceptions are Checkbox, Web Site, and Action). Besides, you can rearrange their order with the help of drag and drop action. While adding a new cart price rule with the Magento 2 gift extension, you have to deal with five tabs of settings: Rule Information; Conditions; Actions; Labels; and Manage Coupon Codes. In Rule Information, specify a rule name and description, as well as choose status, websites, and customer groups. Next, choose whether to use coupons or not. For Specific Coupon, you should enter a coupon code or enable auto generation, as well as set uses per coupon. Then, the Magento 2 gift extension offers Uses per Customer, From, To, Priority, and Public in RSS Feed options. As for the Conditions tab of the Magento 2 free gift extension, it lets you apply more precise conditions for your promotions. Add gift with each N-th product in the cart. Depending on the action you choose, the next parameters vary a lot. 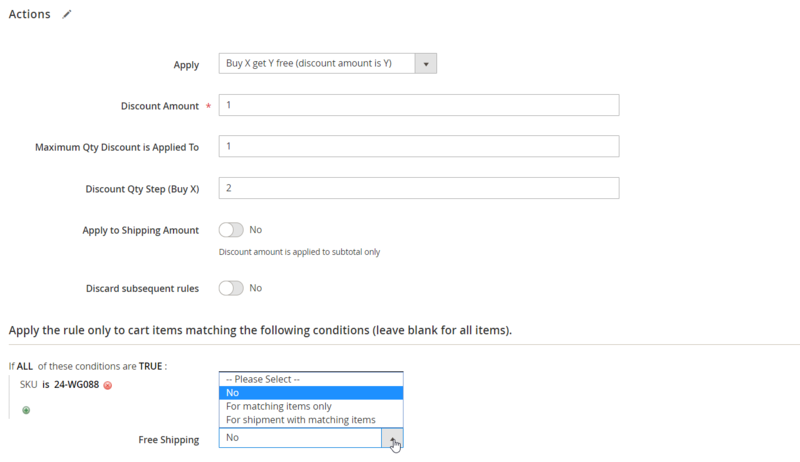 In case of ‘Buy X Get Y free’, the Magento 2 gift module requires specifying Discount Amount (number of promo items), Maximum Qty Discount is Applied To (maximum number of free products per order), Discount Qty Step (Buy X), Apply to Shipping Amount, and Discard subsequent rules (Yes/No). 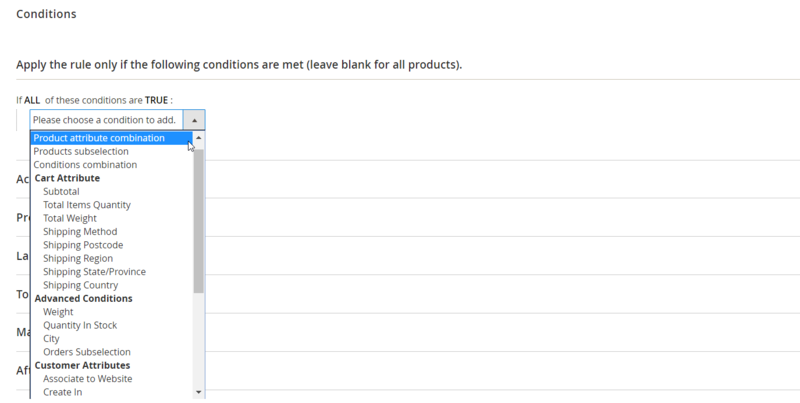 Then, you can select specific conditions for applying the rule and choose whether to provide free shipping. 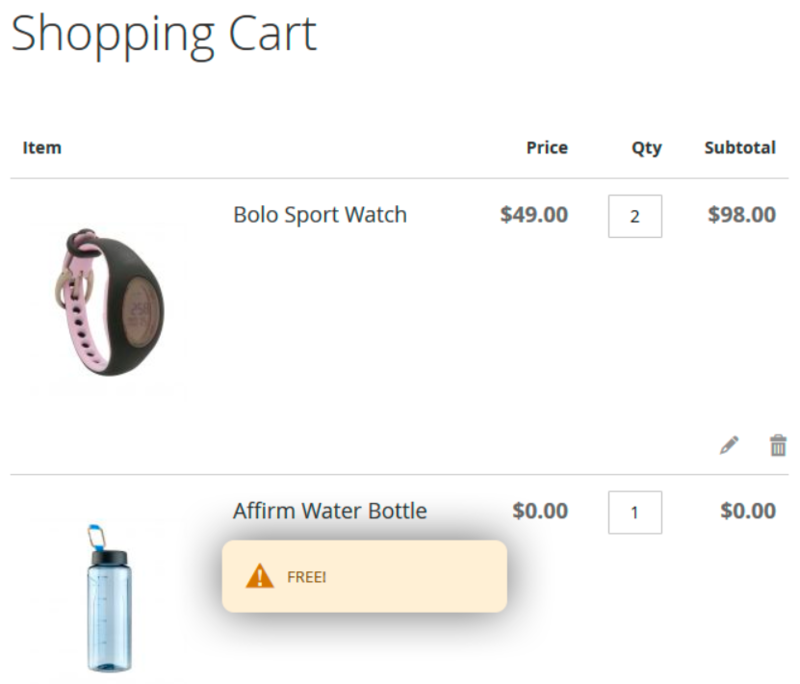 In Labels, specify default rule labels and specific store view labels. 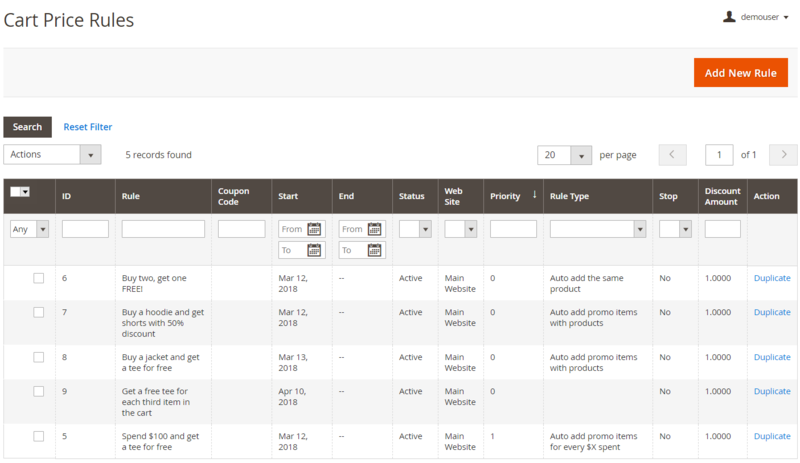 The last section of the New Cart Price Rule interface allows admin users to generate and manage coupon codes. As for Magento 2 gift extension configuration settings, they are divided into five sections: General, Messages And Notifications Settings, Limitations, Product Page Banners, and Gift Images. In the General section, you decide whether to add simple, virtual, and downloadable products automatically without confirmation or not. 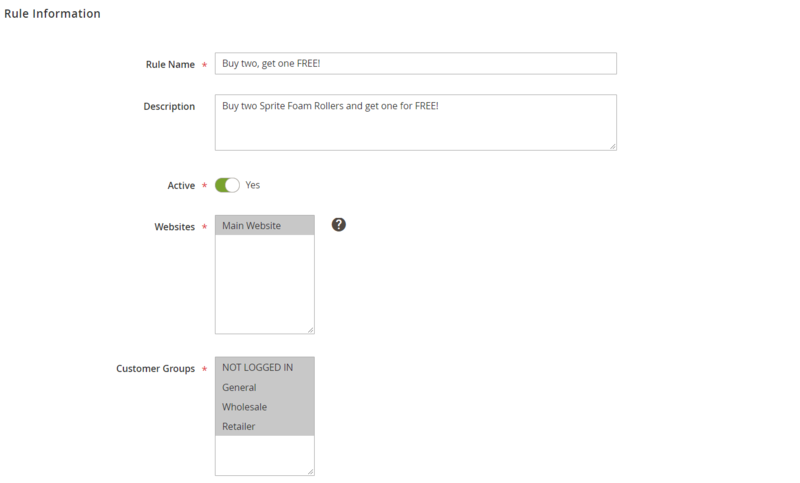 Also, you can allow adding discounted items along with free ones to the cart. 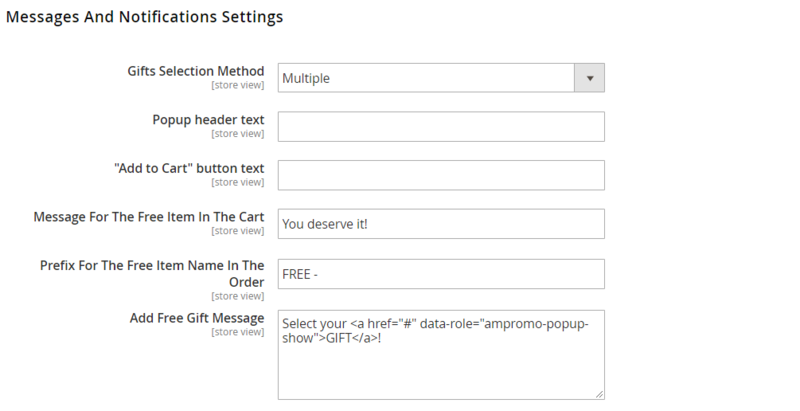 As for the Messages And Notifications Settings section of the Magento 2 free gift module, it enables you to choose gifts selection method (one by one or multiple) and enter custom text for the popup header and Add To Cart button. Also, it lets you specify a message for a free item in the cart, prefix for the free item name in order, and free gift message. Besides, you can enable gift popup to be opened automatically on the cart page and display of the original product price in the popup. Note that both error and success messages can be displayed or hidden, as well as remaining gifts counter. Next, enable/disable reminder message informing frontend users about available promo items and create text for the notification. In Limitations, you can set the option to skip products with special prices when offering promotions. If you choose Yes for the first setting, then you can configure promos for configurable products with child items that have a special price. In the next tab, select how to validate conditions for banners: whether based on a product page or the contents of a shopping cart. Then, enable/disable promo banners position on top of a product page and above Add to Cart button (After Product Description Banner). Also, decide whether you want to show only one banner. In the last section of the Free Gift extension’s configuration, you set parameters for display of free products images: image width and height in pixels and product attributes for header and description displayed when a user hovers over an image. Also, as we have mentioned above, it is possible to use even configurable products as gifts. New address condition ‘City’ was implemented. 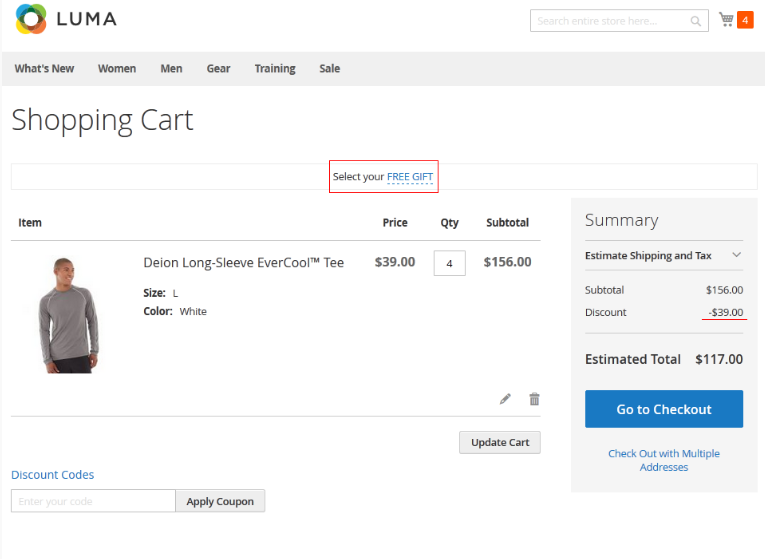 New feature: customize the popup window header text and the ‘Add to Cart’ button text. Discounted products can be added to the cart automatically now. New feature: the number of available gifts can be displayed in the popup window now. 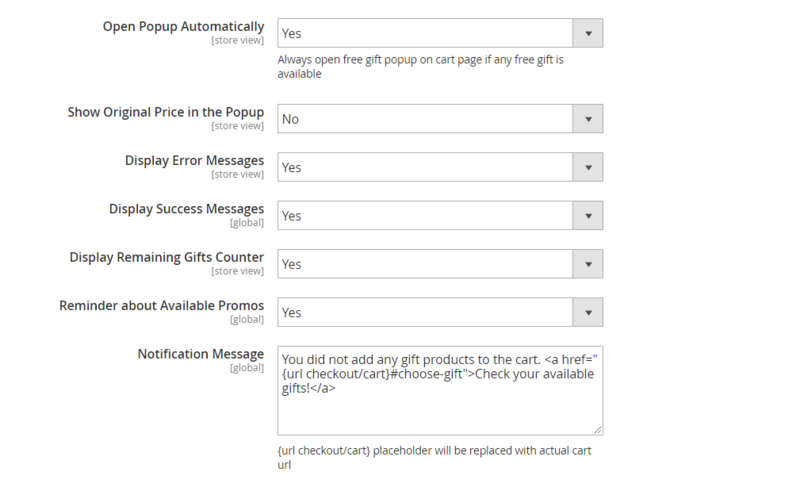 Checkboxes were added to the popup to be used by customers when choosing multiple gifts. New feature: possibility to tax gift products based on their original price. Gift products can be shipped free of charge now (‘Apply shipping on promo items added for free’ option in the rules configuration). The list of available attributes applied to conditions was extended, including customer attributes, order history, and product attributes like Qty in Stock and Weight. 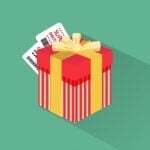 A new action was added: ‘Add gift with each N-th product in the cart’. 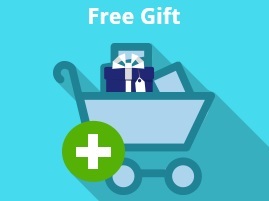 New option: discounted products can be added as a free gift to the cart. New feature: show an old price along with the discounted price in the popup. A new option was added: downloadable products can be used as gifts now. ‘Stock Qty’ and ‘Weight’ attributes were added to rule conditions. A reminder about available promos. Ability to skip free gift offers for products with special price.